Would you believe this big dragon is scared of a little mouse? 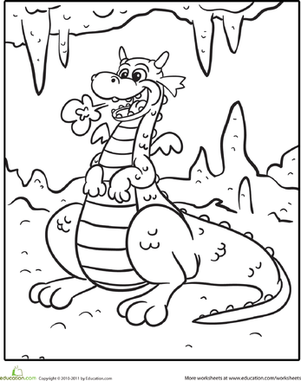 Share a fun dragon coloring page with your child, and to exercise his imagination, challenge him to come up with a story behind this funny picture. This cute dragon is sure to make any child smile, and he'll get great fine motor skills practice as he works on coloring inside the lines. The wild cat has found a friendly little mouse. Color them both, and don't forget to review sight words and the names of animals with your little one!